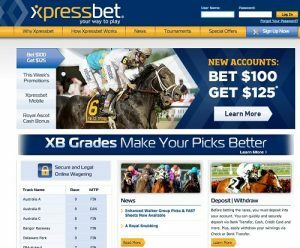 For the past 15 years Xpressbet has been one of the top racebooks based in the United States. Handicappers from all over the country can watch and wager on more than 300 thoroughbred and harness racetracks around the world. This online wagering platform allows fans of EZ Horse Betting the opportunity to play the horses from the comfort of their own home and is legal in all 50 states. When you create an account with Xpressbet you can access the same betting menus and options that are available at the track. You’ll also be able to take advantage of generous welcome bonuses and player rewards. Finally, there are plenty of free and paid handicapping tools available which will make it easier for you to pick winners and cash tickets. Xpressbet was founded in 2002. The racebook operates under the authority of the Oregon Racing Commission. It is 100% legal for use by U.S. residents and allows account holders to place bets via computer, phone, or tablet. All customer deposits are guaranteed by the Oregon Racing Commission which insures that payouts are handled quickly and accurately. The website uses military-grade security measures to provide one of the safest horse betting environments you will find online. All customer information is safeguarded to the highest degree. You can wager with confidence that your personal data is secure. There are no monthly betting requirements, sign-up fees, or other costs associated with creating an account at Xpressbet. The money made by the company is derived from the takeout, a portion of each wagering pool that is deducted before winners are paid. This is the standard way live tracks and racebooks operate. Newcomers to the exciting world of EZ Horse Betting will find that the Xpressbet platform is intuitive and easy to manage. The software used to operate the racebook is designed to be cutting-edge and user-friendly. Even with no previous experience you can be up and running within minutes of creating your account. All it takes is a few simple clicks in order to make a bet. Xpressbet offers a wide variety of deposit methods. These include Xpressfund which is a unique wallet that permits secure electronic transfers from your bank account. You can also load your account with a Green Dot Money Pak that can be purchased at many convenience stores. The PayNearMe service available at many 7-11 stores is also an option, as are Visa and MasterCard. When the time comes to withdraw your winnings, there are two options. You can choose to use Xpressfund which deposits the withdrawal directly into your bank account. The other option is to have a paper check mailed to your home. It is possible, for an added fee, to have the check delivered by FedEx. Standard delivery guarantees that the check is mailed out the next business day. Most Xpressbet users comment that they always receive their withdrawals on time and that their deposits are typically made available immediately. The bonuses offered to new members change frequently. It is best to check the Xpressbet website to see which offers are currently being made. In the past, the racebook has provided a 100% matching bonus on a first deposit up to $100. An additional $25 can be received if users choose the Xpressfund option for making a deposit. This racebook also offers players cash rewards for recommending their friends. If someone you recommend signs up and bets $100 in their first thirty days, you will receive a $50 bonus. The best part about this perk is that there is no limit to how many friends you can recommend. Each month, Xpressbet also offers account holders the opportunity to participate in unique promotions and contests which serve up more chances to win free money. There are handicapping tournaments, special prize pools, and more. Finally, players are able to earn reward points that can be used to make bets or purchase swag from the Xpressbet store. You can use your reward points to get free past performances to become a better handicapper, or you can buy some stylish gear that looks great on you when you visit the live track. There aren’t many disadvantages when it comes to this racebook. The only drawback is that the sheer volume of available tracks and wagering options might be a little bit overwhelming for the newcomer to betting on horses. What we recommend is keeping things simple to begin and focusing on a single track or circuit until you become familiar with the platform. We recommend this racebook as a top option for players in the United States. It is comparable to other popular racebooks like TwinSpires or BetAmerica. No matter where you live, Xpressbet is legal to use and gives you all of the tools you need to become a superior handicapper.